Bach Inventions set to jazz, a symphony based on the digits of pi, stone carvings in marble or limestone, a cartoon manatee named Hugh, and the Burt St. Boys ( a family jazz ensemble) are some of Lars' current endeavors. The Europeans will not be able to celebrate this day because they intelligently spell the date with day, month and year, unless they add a 31st day to April. No wait, it could be the third of January at 4:15 --hmm. You see, the digits of pi (3.14159265358979...) are spelled out in the moment on 3/14 at 1:59pm, year 2653. I wonder what life will be like then. Well, anyway, here's a snippet of what life is like now. Building, building, building. And now, this winter, a bit of a break from it. The thing I love about math is its basic honesty. If only people could be held to such a stringent degree of truth. After 20 years, the performances went great, and I would like to continue. If you know any orchestras or conductors in China, Australia, South America, or South Africa, please tell them about Pi Symphony. Or, tell me about them! As an example of other melodies based on mathematical sequences, I composed the "Power Of Two ( the binary waltz) ", and "The Unsquare Root of Two ( a radical melody) ". The latest Burt St. Individuals' CD , called "Sunday Sessions", came out early 2011. We're working on the next set of 'Tunes' and our focus has shifted from 'gigs' and practice, to practice and recording. Over the past several rehearsals, we have laid down seven tracks. The quality is really great, and our our work is paying off. The time in eastern Europe working with an orchestra and capturing thousands of images has culminated in a couple of YouTube videos and the audio will also be available soon on a CD called "Pi Symphony: The Ruse Performance". Here is a link to the YouTube videos from our adventure. The house is begun.I have learned this year that good things can come from bad things. Really good things can come out of really bad things. I have started a new YouTube channel with short videos showing various aspects of building. Feel free to roam around here in my 'Creative warehouse' If you decide to make a purchase of a CD, just visit the Music Store and ask for Lars. I have been cleaning it up a bit, and straightening out the displays. It really is the best way to buy music, directly from the artist. You can email me here if you like. I love to hear from people who read my page. with my son, Alek. Here's a link to a page describing our efforts. Since we have posted this, I have helped people all over the world with questions about toothpick bridges. 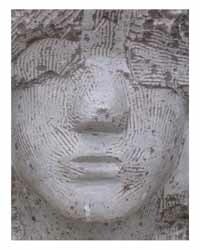 For a couple years now, I have been pursuing stone sculpture. 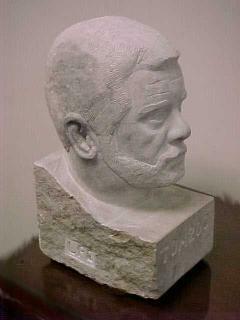 I am concentrating on realist portraits in limestone. Check out some examples. An accurate representation can take up to 8 hours of 'sitting' which happens in roughly three sessions. The result is a life size 'head' which usually weighs about 100 lbs. in solid limestone. Why not get a head? Stone is cool. 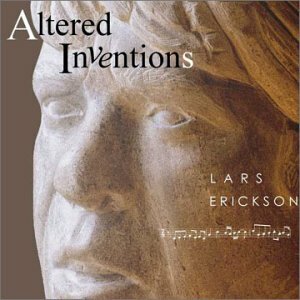 Altered Inventions was released in August of 2002. It is a collection of Bach 2 & 3 part inventions arranged for jazz. Many are performed in altered time signatures and recorded digitally with classic jazz instrumentation - Piano, Bass, drums, flute. The Burt Street Boys, a be-bop jazz trio. After playing our first professional engagement in May 2003, the playlist has grown and the boys' talent has too. After playing three sets nearly every weekend in the lobby of a large lodge retreat for about three years, we now play concerts and regular jazz gigs. In 2006, I invited the daughters to join us (we still are called the Burt St. Boys) on clarinet, cello and flute for a concert in Omaha. I guess there is no question about it, people want to hear a voice, even mine once in a while. I wrote this song of thanks, which I can say was written for quite a few influences in my life. Who Can I Thank, But You. ...had to stop playing because Emma just had her wisdom teeth out and needed quiet. 'Hugh the Manatee' is a cartoon character who is the personification, or should I say 'Animation' of humanity. If Hugh symbolizes the slings and arrows of humanity, his many supporting characters are those slings and arrows. Polly Tickle , Albert Ross, Ida Clair,Miss Apres Hensen, Rosetta Stone, and Terrence ( a dog) are just a few of his many friends.